Flood waters in the harbor of Blue Hill lap over the top of the town pier off Water Street in this Nov. 16, 2016, file photo. The National Weather Service office in Caribou issued a coastal flood warning from Friday at 7 p.m. to Saturday at 7 p.m.
Coastal parts of Hancock and Washington counties — including the cities of Ellsworth, Bar Harbor, Bucksport, Castine, Eastport, Machias and Cherryfield — are affected by the flood advisory. Effects from flooding are expected within two hours of the high tide cycle, according to the NWS. High tide in Bar Harbor is expected at 9:33 p.m. Friday and 9:46 p.m. Saturday. 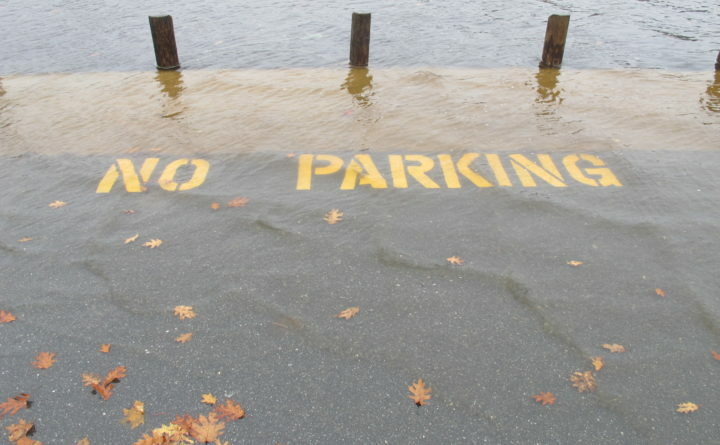 Residents can expect shallow flooding in vulnerable locations near the waterfront and piers. “Flooding begins on Route 1 in Machias and Route 190 in Eastport. Some low-lying causeways will have water beginning to approach the road with up to 1 foot of inundation above ground level at vulnerable low lying areas. The majority of roads will remain passable with only isolated closures,” according to the flood warning. The National Weather Service also cautioned of heavy rain and snow melt in other parts of the state, with 1 to 3 inches of rain expected in much of Maine. “The rain will combine with snow melt and may produce localized flooding of urban and low-lying areas and the potential for ice jams,” according to the NWS. The National Weather Service urges pedestrians and motorists to use caution along the shore and in other areas affected by flooding.